Based on decades of empirical evidence, the general consensus among 95% of the world’s drivetrain scientists has been that a 12-speed road group would someday soon become reality. The other 5% of drivetrain scientists either based their studies on long defunct Suntour drivetrains, or were secretly funded by Grant Peterson in an effort to discredit drivetrain evolution. The only surprise in today’s industry news is that Campagnolo beat SRAM in officially debuting a 12sp road group. Two years ago SRAM introduced 12sp for mountainbike single-chainring drivetrains, and it seemed entirely plausible that they would steamroll that tech right into the road market. 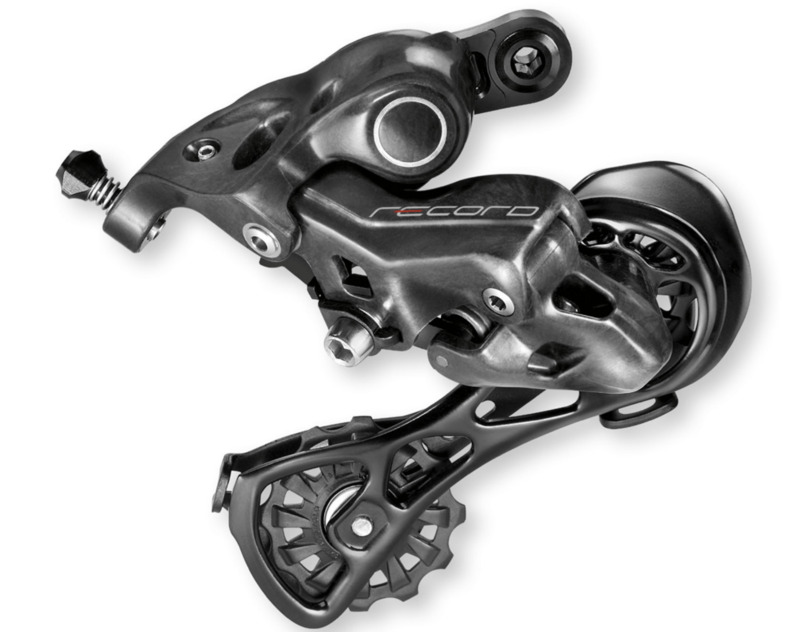 However, SRAM’s rationale behind a twelfth cog was that the thinner chain and cog teeth were more than compensated by the elimination of the left shifter, front derailleur, and one chainring, and a significant portion of mtb consumers and bike brands have agreed. But the road market is in many ways rigidly traditional, and SRAM’s marketing success with 1×11 road drivetrains has been much more muted (though there are definitely some true believers out there such as Gerard Vroomen of 3T/Open Cycle). So Campagnolo’s MOVEMENT 12 introduction (what is it with the bike industry’s obsession with all-caps?) is on one hand bold and on the other very predictable. Campagnolo has been on the forefront of adding cogs to the cluster, being the first to introduce 10sp and 11sp drivetrains (also they debuted 9sp head-to-head with Shimano back in 1997). And the venerable Italian brand is sticking to double chainrings, using the twelfth cog to tighten up the ratios at the low end of the gearing, rather than gambling on a road racer paradigm shift to the 1x concept. Once the 12sp groupsets, for now just in the Record and Super Record product lines, are widely available they should surely find little obstacle to acceptance among professional teams and riders, who have a central role in Campagnolo’s marketing strategy. The groupsets will have both disc and rim brake options, but the press release makes no mention of EPS, Campagnolo’s electronic shifting system that exists for current 11sp. 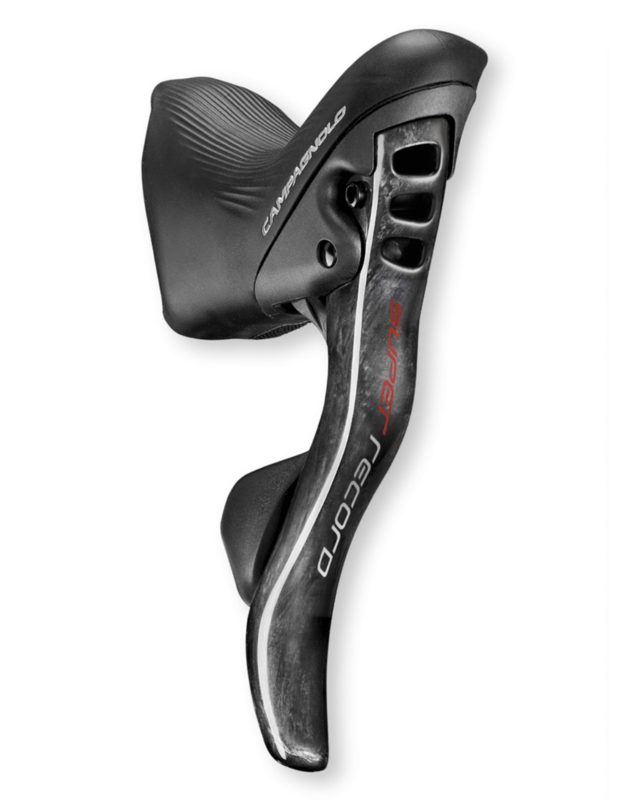 A quick glance at the rim brake Ergopower levers reveals the brake blade and shift paddles have been refined for better ergonomics. 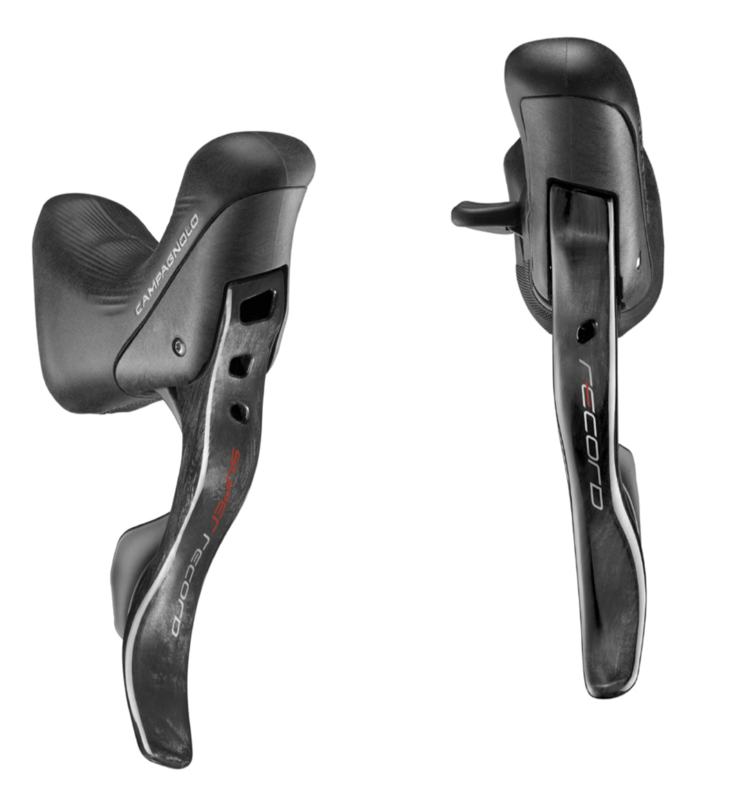 In the past adjustable brake reach was precluded by Campagnolo’s use of an integrated brake caliper quick-release in the lever; the new version has a multi-position QR button that effectively creates 3-distinct reach positions. Also the brake blade, already the most curvaceous of any integrated lever on the market, has been further sculpted to work with differing hand sizes. The shift levers are a little larger and the mechanisms have been tweaked to reduce dead stroke before the mechanism activates. At the other end of the line, the rim brake calipers bear no resemblance to the previous generations of clampers. They are very angular, particularly at the front arm, and lack the forged in windows that gave the old calipers the “Skeleton” moniker. 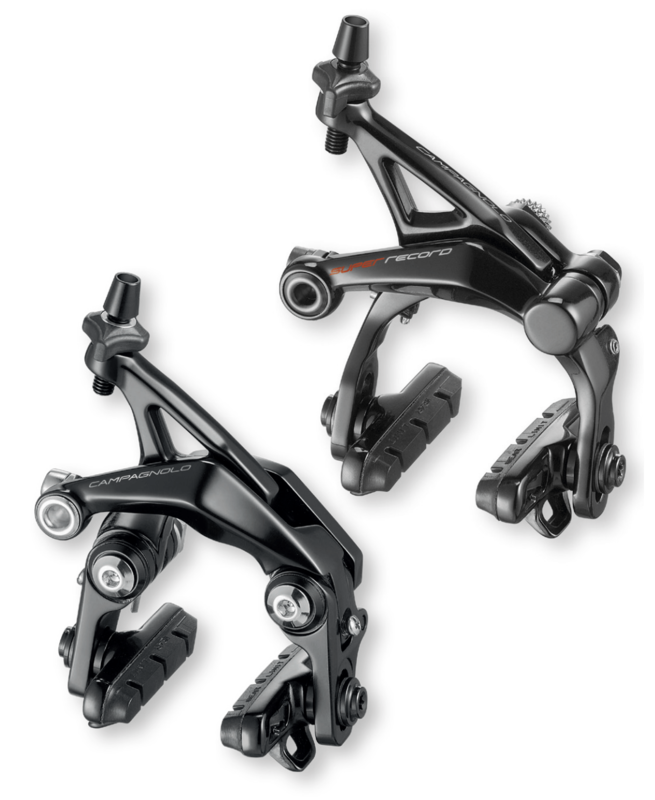 They actually come in both standard short-reach for Record/Super Record and a non-series direct-mount style, though unlike Shimano who use a symmetrical dual-pivot geometry for both, Campagnolo’s standard caliper design retains the typical central pivot plus offset pivot. In both cases the calipers lack QR features, since as mentioned those are located at the lever. The cranksets retain the four-arm/8-bolt configuration of the most recent 11sp cranks which allows standard, compact, and semi-compact chainring combinations to be mounted on the same arms. The new cranks seem to be based on the existing UltraTorque design, but the smooth face of the right arm is unbroken by the spindle, so seemingly the fixing bolt for the UltraTorque’s Hirth joint is fed in from the left side. 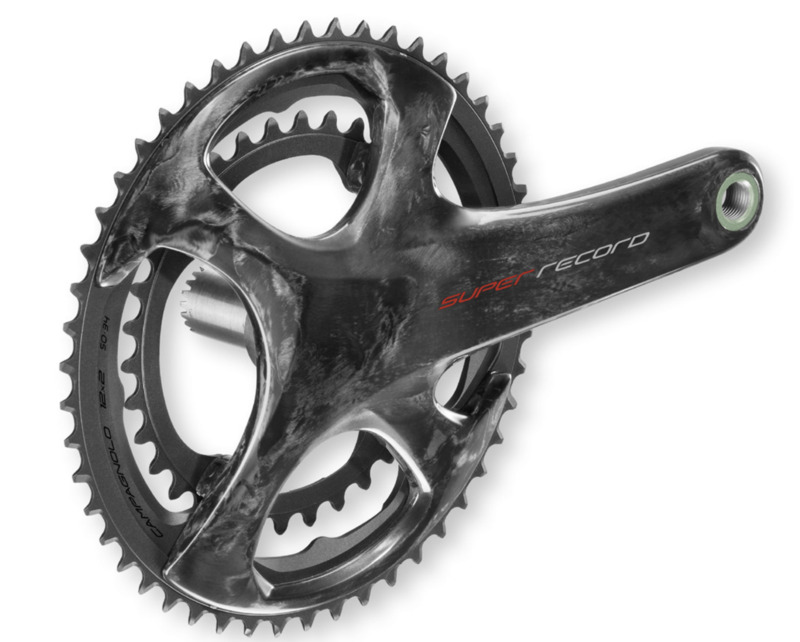 Unlike the H11 crank that features a wider chainline optimized for 135/142 rear disc hubs, the new 12sp Record and Super Record cranks are said to fully compatible with both rim and disc brake drivetrains, though no specifics provided concerning chainline. The front derailleur uses an actuation arm that is distinct from the parallelogram. The new mechanism is said to lead to quicker initial movement of the derailleur cage. Looking very much like a Huret Jubilee derailleur re-imagined by HR Giger while in a particularly brutal frame of mind, the 12sp carbon rear derailleur is perhaps the most radical departure from Italian traditions of yore. A couple years ago Campagnolo changed the actuation ratios of their 11sp product while introducing offset parallelogram pivots on the rear derailleur. The 12sp goes even further with an offset B-pivot similar to Shimano’s “Shadow”-type rear derailleurs, though it is unclear whether Campagnolo’s design uses a B-pivot spring or is unsprung like Shimano. The bulkiness of the carbon upper knuckle implies a spring might be buried in there, but since the PR didn’t make it clear one way or another we will have to wait for clarification. 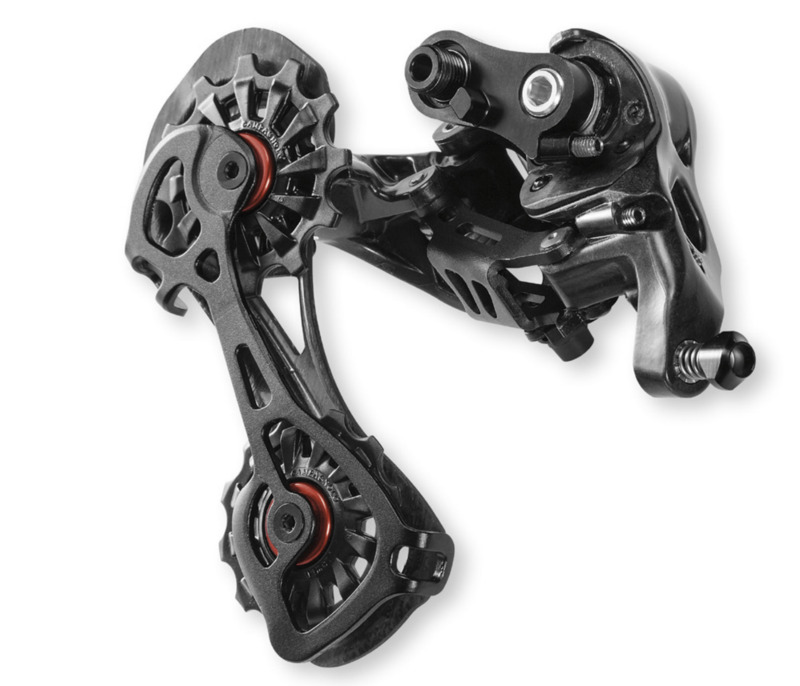 It is implied that the new derailleur can function as a direct-mount with the removal of the link that secures the upper knuckle to traditional derailleur hangers. What Campangolo does say is that the derailleur geometry has been optimized for the profile 11-29 and 11-32 cassettes, so that top pulley will track consistently and accurately across the individual cogs. The larger size and reduced ratio options are the natural result of adding more cogs to the cluster. 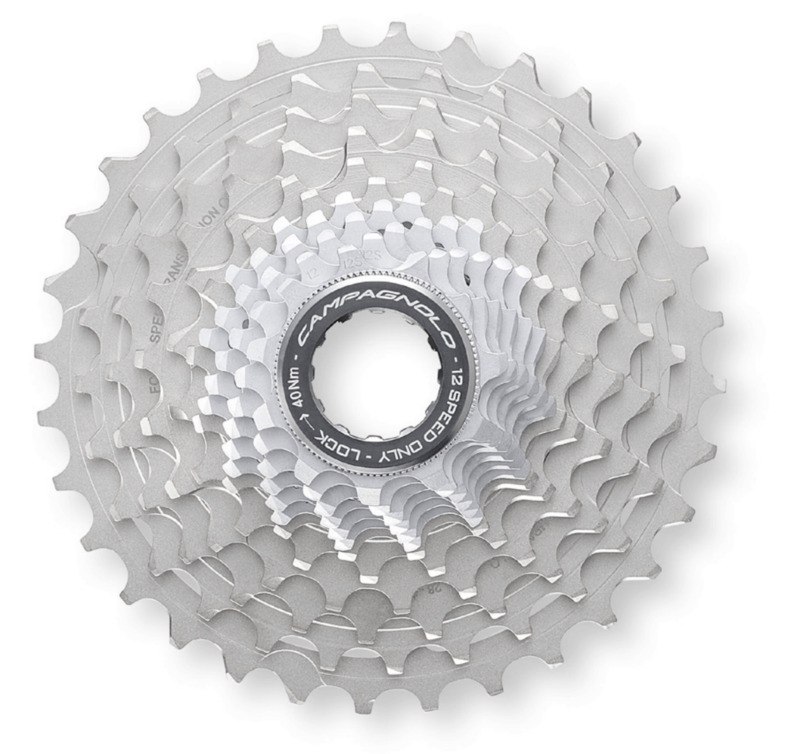 Both cassette options are basically straight blocks for the first 2/3rd of the cluster that then give four progressively spaced climbing gears on the low end, so there is little to gain in offering marginally different 11-23 or 11-25 cassettes. Perhaps we could see maybe an 11-27 in the future though? The new cassettes fit on existing 10/11sp Campagnolo freehub bodies, so going to 12sp will not require you to replace your current Campagnolo-compatible wheels. To be honest, I have not been devoted to Campagnolo since the end of the 8sp-era, which coincidentally was the last time I was actually excited about addition of another cog, but I think that a lot of Campagnolo’s more recent designs have been both attractive and technically refined. Still, it’s hard for me say that anyone needs a 12sp double road drivetrain. Perhaps one can argue that the twelfth cog makes the bike fully optimized for both flat-terrain and climbing. To me the cumulative improvements to the levers’ ergonomics, the rim brakes’ geometry, and the cranksets’ aesthetics are the main features, and the twelfth cog is simply an occasional benefit. If you are surprised that Campagnolo is lagging behind on the electronic version of 12sp, you need only realize that the company has recently rolled out a lot of new designs in a short period of time without the resources financed by a huge OEM presence like Shimano or SRAM. Campagnolo surely won’t wait too long to roll out the EPS version though, since the World Tour pro teams are all gung-ho for electronic shifting nowadays. It will be interesting to see if the teams hold onto the 11sp EPS rather than go to the 12sp mechanical shifting.